In 2012 my wife and I decided to shake things up. We were both overly stressed, overworked, overweight, and over our urban existence. Our lifestyle and environment were sending us down a path of misery and discomfort and we needed to make some changes. We started with our diet, going so far as to start a farmers market in our North Long Beach neighborhood and turn our small yard into an edible foodscape. We started educating ourselves about where our food comes from and started the slow, and still ongoing, shift away from processed and industrialized food to local, raw ingredients that we cook into healthy, nutritious food. We got pretty serious pretty quick and decided that I would jump ship from Hollywood to focus on Urban Agriculture in order to grow as much as our food as possible and to incubate some businesses to support our shift to a healthier and happier lifestyle. Our journey into Agriculture was sparked in North Long Beach but quickly expanded beyond the realms of the city. We decided to go all-in and start a small farm that would provide us the healthiest food possible and keep us physically active, alert, and in shape well into our golden years. We wanted a safe and healthy place to raise our children, make our living, and support our local communities so we sold our house in the city and rented five acres in the Sierra Nevada Foothills with a little apartment over a barn and started Blue Oaks Farm. I started by growing vegetables for our local farmers markets, the Tahoe Food Hub, and a few caterers. We added beehives and a chicken coop and it was soon beginning to look a bit like a farm. We had a good handle on the veggies, eggs, and honey for our table and markets so we turned our attention to the meat in our diet. As most of us have encountered, the price point for ethically and humanely raised local grass-fed meats can be shockingly high so we weren’t going to be buying the meat we eat, but I did have a small farm with a few acres of grass under oaks. Not enough grass for a cow, and our rented fencing wouldn’t stand up to goats or sheep, so we fell upon what seemed a wonderful solution: heritage hogs. 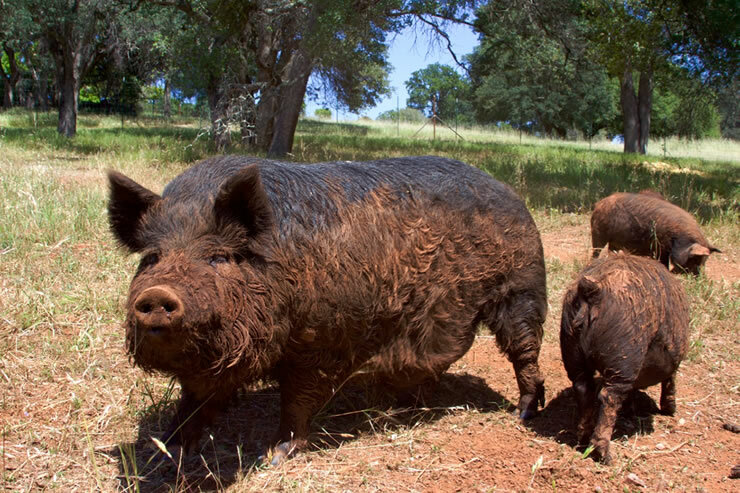 Hogs on pasture?? Yup! 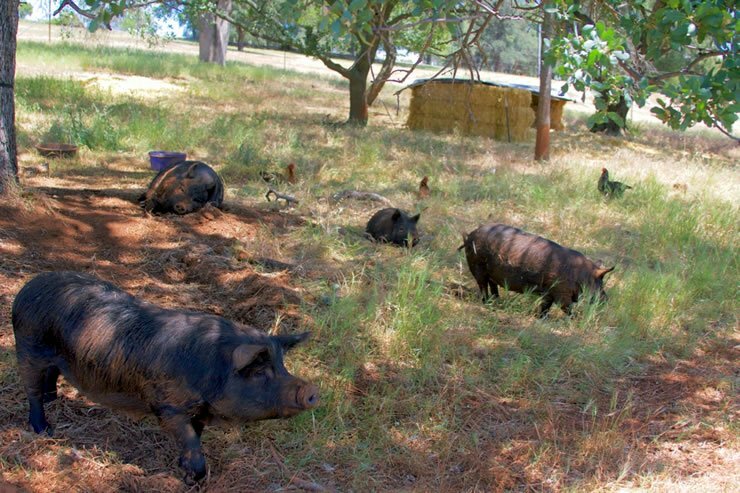 Unlike their commercial confinement-raised cousins, heritage hogs thrive on pasture, tree mast, and rough forage. It’s how they’ve existed on and off the farm until the recent invention of the modern industrialized food system. 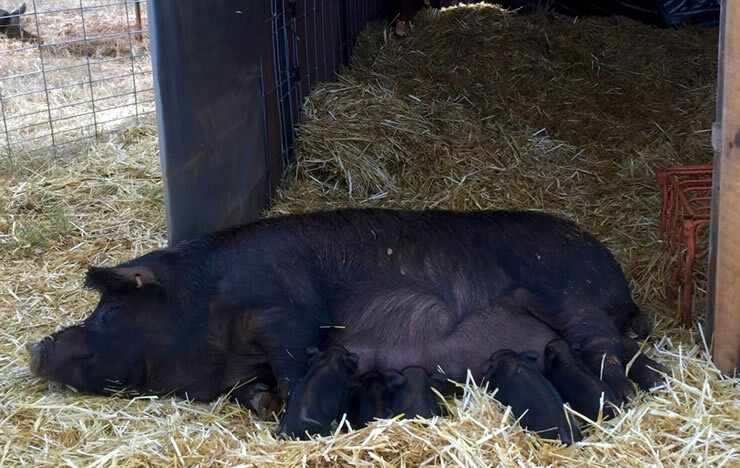 They are smaller and generally have a more gentle temperament than commercial hogs, a perfect match for us. As I researched and learned more about raising hogs I became intimately acquainted with how the vast majority of our pork is raised, slaughtered, and processed in industrialized confinement factories mostly located in the midwest and southeast. Not a pretty picture. I realized I had an opportunity to raise our meat in an entirely different way and to reintroduce the pastured pig to our small farm. My ultimate goal being to provide a “birth to butcher” life entirely on our farm, where we can provide our hogs with the best pasture and a safe environment where they live their entire lives, root, explore, wallow, and play. When the time for butchering comes, instead of being loaded into a scary livestock trailer, hauled hundreds of miles from their home, and forced through a stress-hormone-producing modern USDA slaughter, our animals would never leave our farm and would be dispatched on site, in a stress-free, familiar setting, by familiar faces that have given them nothing but love and caring their whole lives. 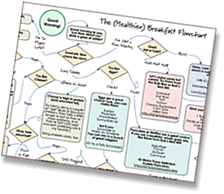 There are some serious impediments to that plan, but we do have some solutions – more on that in a bit. So what makes heritage hogs such a good choice for our small farm and for you? Heritage pork is very different from “the other white meat.” Heritage breeds have a darker, richer meat that is beautifully marbled with fat that cooks better, looks better, and tastes better than anything you’ve had before. Generally, heritage pork is raised on smaller farms and usually on pasture, as opposed to the industrial confinement-raised pork available at the supermarket and the vast majority of restaurants. The entire animal is useful; there is virtually no waste. “You can eat everything but the oink” is by no means an overstatement. You get more meat for your dollar and know that you are celebrating every bit of the animal that is giving you sustenance. A half a heritage hog is perfect for a small family’s (extra) freezer, providing a diversity of cuts and meats lasting months. Hogs provide us with a huge range of delicious and healthy food products including fresh meat, fresh sausages, hams, bacon, hocks, dried sausages, cured meats, super-healthy bone stock & broth, lard for eating, lard for soap, lard for lotions…and the list goes on. All of these can be made at home and most work wonderfully as part of your October Unprocessed pledge. Hogs are omnivores, like us. 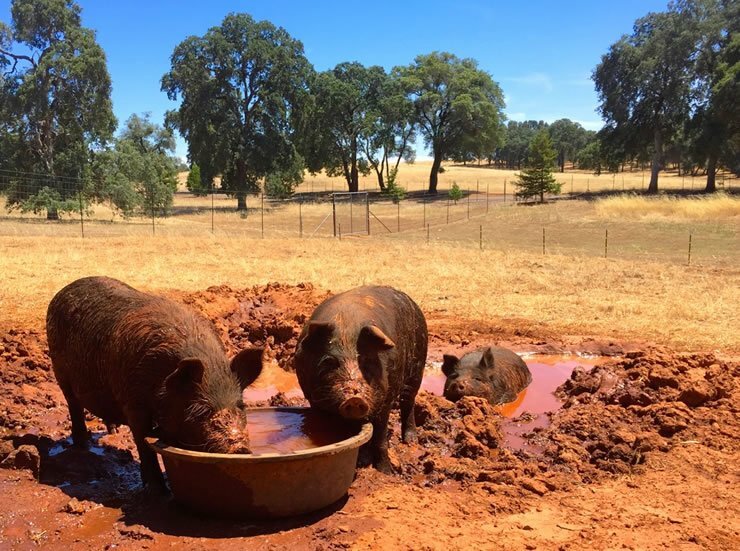 They eat just about everything so the farmer has a great degree of freedom to use the best local food sources available as well as the ability to grow a lot of the hogs’ food themselves. 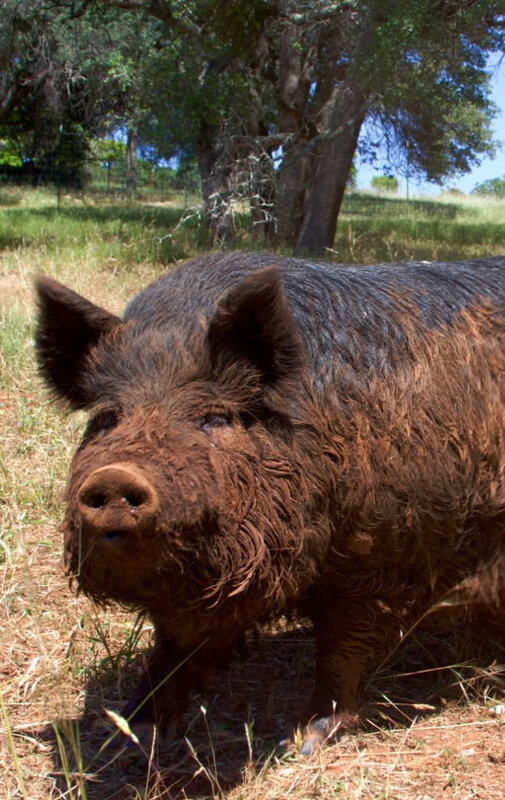 Heritage hogs are a product that is just not available in markets and butcher shops. With rare exception your only choice is to buy your heritage pork directly from a farmer, which is a relationship we farmers are very excited about developing. Now, a moment for some advocacy for small farm and local food freedom. I’m sure most of you are aware that all meat sold retail in the United States must be slaughtered at a federally certified and regulated facility and inspected by a USDA meat inspector. Sounds great right? Well, not so much from a small farmer’s point of view. With few exceptions, small and independent slaughterhouses have been run out of business over the past 30 years, so there is very little access to these facilities for a farmer that only has a few dozen or hundred animals to process every year. This means that the only practical choice for the consumer these days is meat raised, slaughtered, and butchered in an industrialized setting. For both economic, as well as ethical and moral reasons, it does not make sense for me to haul my few animals several hundred miles for processing at a USDA facility, so I am shut out of the retail meat market for now. Luckily we have one route of sale, which is to sell whole, half, or quarter shares of our hogs direct to the customer with butchering done at a local “custom cut” butcher shop. These shops are state, not federally, inspected and certified, as such the meat they cut goes right back to the customer marked “not for retail sale.” While this is a good option for some, most people would prefer not to have to take up a full freezer just to have some heritage pork. We now have a good potential solution to this dilemma, which I ask you to consider and support. Essentially this would open up intrastate (within a state) retail sales of meat processed through local state certified slaughterhouses and butcher shops. This is a game-changer in the bolstering of sustainable local food systems and a huge help to the small farmer in our attempt to carve back some markets from Big Ag and to provide you with the food possible. If you would like to know more about the bill with some links and sample text for contacting your representative and asking for their support, check out this great summary by the Farm-to-Consumer Legal Defense Fund with a preamble by Joel Salatin. Are you interested in getting your hands on some beautiful heritage pork? How does one find some? Start with a search of your local farmshed using the increasing selection, of excellent search tools and websites supporting small farms and local food (Local Harvest, Eat Wild, The Livestock Conservancy, Slow Food) and reach out to your local Agricultural Cooperative Extension office or the closest National Resource Conservation Service (NRCS) both of which work directly with local farmers and should be able to point you to good local sources. Search Facebook and Google; a lot of us are using Facebook and our websites to reach out and develop new relationships. Be specific and see what comes up. Ask around your Farmers Market(s); if people are asking for it, we farmers will grow it for you! If you are particularly interested in American Guinea Hogs, feel free to contact me and I’ll hook you up with a farmer close to you. This rich meat provides for a unique style of pork that isn't commonly used. Put the cast iron pan in the oven. Heat oven to 275 F, and give it at least 30 minutes to heat the pan and oven. Using either a mortar and pestle or a food processor, create a rough paste from the herbs, salt, pepper, and oil. 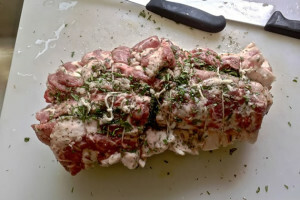 Using butcher’s twine, tie the roast tightly, (here’s a great tutorial video on tying a roast). 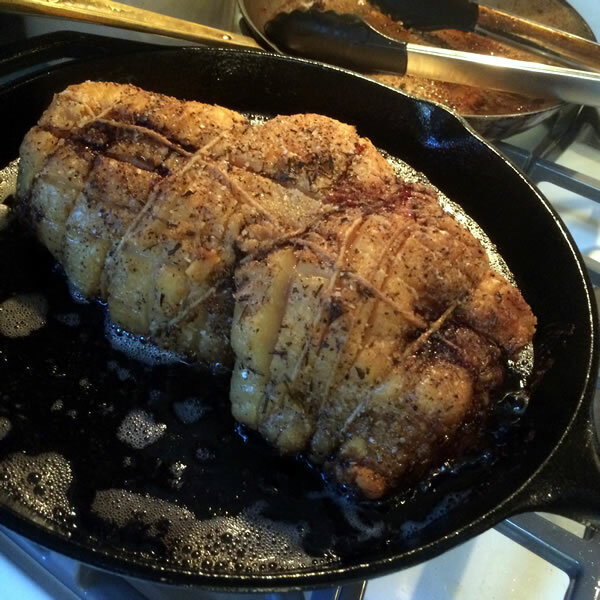 Take the hot cast iron skillet out of the oven and carefully place the tied roast into the skillet. Place skillet and roast back in the oven and roast until internal temperature reaches 145F in the thickest part of the roast, approximately 4-5 hours depending on the size of the roast. While the roast is in the oven, make the Salsa Verde at your convenience, but leave at least 2 hours for the flavors to meld. Once the roast hits 140F increase oven temperature to 475F and roast until the fat at the top is crispy golden, checking frequently, approximately 15-20 minutes longer. Final temp should be about 155F. When the fat is done to your liking, remove from the oven, move roast to a carving board and tent very loosely with foil, cutting a few slits in the foil for steam to escape. Let rest 10-15 minutes. Carve and serve with Salsa Verde or a condiment of your choice. Combine all ingredients except oil in your food processor plus 3/4 cup of the olive oil. Process to desired consistency, adding olive oil to taste. Move to a bowl, cover, and let rest at room temp at least 2 hours before serving. Refrigerate and store for a few weeks. Let come to room temperature again before serving. Do not throw out the rendered fat!!! Save it for a midnight snack, dipping the crusty bread into the herb/garlic infused goodness. When you’re done dippin’, strain the fat through a coffee filter, paper towel, cheese cloth, etc… pour into a glass container or ice cube tray(s) and cool to room temp, then cool in the fridge and/or freeze. You now have an incredible lard that will elevate your savory pastry dough in magical ways. Hi there, great article and recipe! I feel very fortunate with getting all my meat from Joel Salatin. But he also has to drive his animals to a slaughterhouse (except for his chickens). I hope you and farmers like Joel, will be able to dress the animals in a very humane way, eliminating all stress. My wife suffers from serious 3-day migraines with pork a primary trigger. We think it’s the processing and not the meat itself that causes the problem. Do you have any information on this? How can we get a farm raised, non processed roast to try to see if she can tolerate pork? Who kills them? Do you do it yourself? After lovingly raising these creatures. I don’t know how you can do it. As a Vegan I look at this and sob …. how do you look at these animals and be ok with them being killed …. do you think they WANT to die and be on your plate ? I could not agree more, Bonita. They are absolutely beautiful beings. Seeing them there in their mud baths. I don’t know how a person could do it.